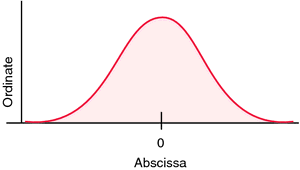 Our approach can fail only if no set of m collocation abscissae can be found that results in a nonsingular matrix W.
Before discussing how to select the m collocation abscissae it is instructive to determine the maximum number of independent linear equations one can obtain using only the collocation constraints (9). max] are the corresponding abscissae of the template. Figures 5 and 6 refer to the first series of tests (cycle of equal mixing time) and they reproduce the temperature and power charts with the usual reference scales: on the abscissae (1 cm = 30 secs) and on the ordinates (1 cm = 25 [degrees] C and 200 kW).